This backing plate is rugged redefined! The Flex-Foam HD Rotary Backing Plate stands up to rigorous compounding and polishing with a durable plate and dense cellular foam pad. The Flex-Foam HD Rotary Backing Plate has superior flexibility, durable construction, and easy transitioning from flat to contoured surfaces. A rotary polisher is demanding on backing plates. The heat and speed of a rotary polisher can wear out a backing plate quickly. Get a backing plate made to work as hard as you do. The Flex-Foam HD Rotary Backing Plate is well-constructed of an impact resistant, synthetic nylon plate bonded to an inch thick layer of dense, flexible foam. 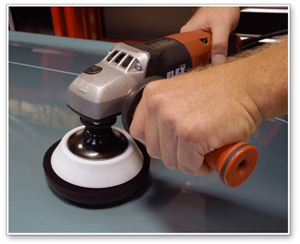 The foam enables the Flex-Foam HD Rotary Backing Plate to conform to flat and curved surfaces to create uniform results over the entire vehicle. The Flex-Foam HD Rotary Backing Plate fits 5/8 x 11 inch threaded rotary polishers. The backing plate features hook and loop fasteners for quick and easy pad changes. Get a backing plate that stands up to the demands of rotary polishers. The Flex-Foam HD Rotary Backing Plate is ruggedly built and flexible for superior performance. Nice and thick backing plate. Very flexible. Quality seems cheap though. Giving it a 3 for price to performance ratio. This is a nice backing plate for your rotary because it has the foam which helps give you a smoother polishing experience. It is similar to the 3m backing plate but just not as soft as the 3m.